in all matters of systems packaging. Cases | Packaging | Partial packaging | Pallets. Made of wood. We will be happy to discuss matters with you in person and inform you which preservation method is the most suitable for you. Our Head Office is in Merzig, a town within the border triangle of Saarland, France and Luxembourg, right in the heart of Europe. Here, we now provide employment for 35 people. Our C.E.O. is Ursula Schmal. We’ve been doing what we do for a long time. That’s why we do it so well. 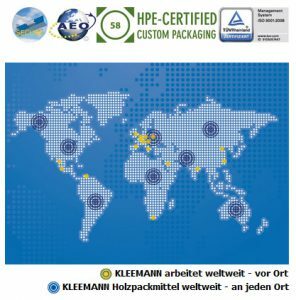 KLEEMANN wooden packaging – around the world – at every location. The things we do, we do properly. Nationally. Internationally. Globally.